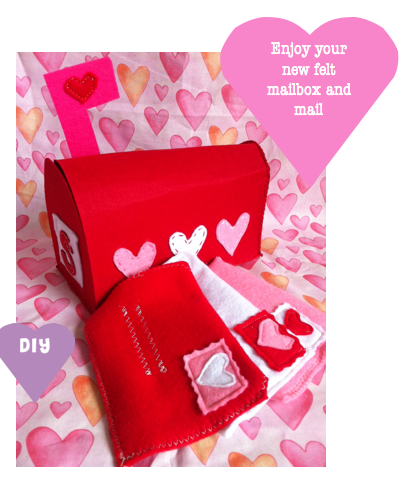 We had lots of fun making our felt Valentine's envelopes and we needed somewhere special to put them! Best place for mail is a mailbox! 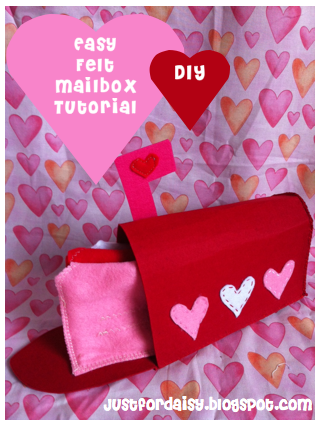 So here is a quick tutorial on how to make your own felt mailbox. I cut/stitched this freehand so you will need to be a tad savvy as it's fairly DIY and not very accurate/specific in it's construction!! After pinning some cute felt lined fabric mailboxes on Pinterest I wanted to make some for my nieces for Christmas. It all seemed a little tricky, needing three layers, fabric, felt and a stiffener so I went on the hunt for another way! Our local craft/fabric store (Spotlight) had A3 pieces of stiffened felt. They looked perfect! At Christmas time I made three cute mailboxes for my nieces with their own matching felt envelopes. 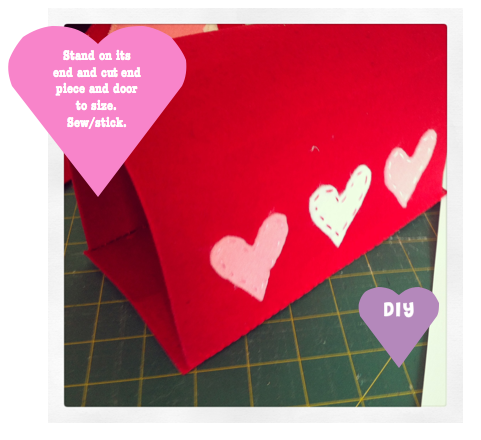 Here are the measurements I used to make this cute little sweetheart heart mailbox. Your base will be 4" x 8" and the top 8" x 12"... I use the rest of the stiffened felt to create my two ends once I have sewn the top and base together. Miss Daisy wanted to help with some sticking. I then stitched over the hearts to secure them. I use a whip stitch for these and it seems to work well, it's easy to sew and holds well. You could do a blanket stitch too I guess. This bit is optional. 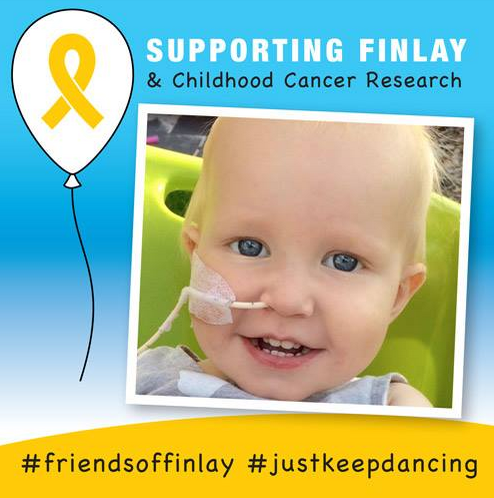 Flags aren't typical on mailboxes in Australia but I think it made a very cute addition and it was a good way to talk about the mailbox having mail or not and how we could notify people! Fun! Again, I cut this freehand and attached a mini felt heart. To create the end and the door I stand the whole thing up on the stiffened felt and trace so I get an exact size. 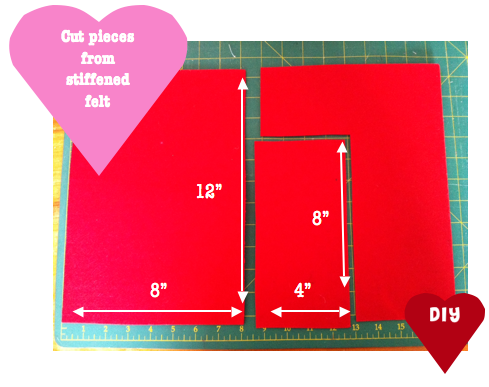 This is important as the stiffened felt can bend a bit funny so you may have a different shaped door than you thought! :) Simply trace, cut and attach! I also sewed on a little 'S' monogram to the front of the mailbox. You could put a 'house number' or the word 'mail' here if you like! And you're done! 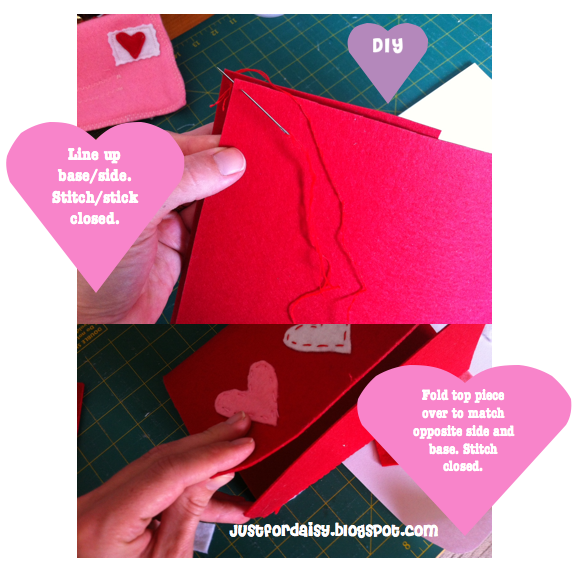 Be sure to add some cute felt envelopes and your little one will be writing notes and sending mail happily!